So, I took the class at the San Francisco Center for the Book (SFCB). I had a LOT of fun and learned a bunch more about book binding. For the class we had some really cool Paste Paper, made by our instructor, Juliayn Coleman. The colors were interesting and the paper had a 3-D sort of vibe when you looked closely at it. I was inspired. Paste paper is basically sheets of paper that are decorated with pigments mixed in a paste that creates designs. The papers are used to cover books or boxes, or for other projects that a book binder might need decorative paper for. This is not marbled paper, which is even more interesting a subject but takes a lot more equipment to get going. I searched the internet on methods for making paste paper and there was a ton of information. There are some videos on youTube and plenty of other places to gather knowledge. Armed with a bit of information and with no fear of failure, I started making paste paper. The first few pieces were kind of clunky, but I am getting some nice techniques down that are generating useful papers. 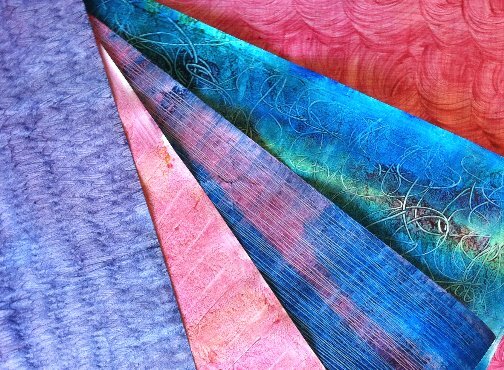 Doing paste paper is a very low-cost, easy project to try. I got set up with paper and paints for less than $30.00. Give it a go and let me know how your papers turn out! This entry was posted in Book Binding, Crafts and tagged arts and crafts, Book Arts, Bookbinding, crafts, hand made. Bookmark the permalink.